Sweet Baby Mallory: Chemo makes . . .
Chemo makes . . . I have fought her over and over and over to drink even a small amount of food yesterday. I thought she was getting better at eating more at a time but that is not the case now. She looks pale, doesn't want to sleep, doesn't want to eat, won't let me put her down, and she just doesn't feel great. Its horrible to watch her be so miserable, we can't give her tylenol (they don't want you masking any fevers whatsoever because it can be a sign of an infection). The Zofran doesn't seem to help. I just wouldn't be surprised if her hemoglobin tanked and she needs another blood transfusion tomorrow. She has the cutest biggest rosiest cheeks I have ever seen, and now she looks so so very sick and it's just breaking my heart. She slept a total of 4 hours last night (broken up with a feeding in between), and now she's been sleeping since 7, so hopefully she takes a NICE long nap so that she feels a little bit better. I am having a hard time trying to decide what is "normal" baby and what is the effects of the chemo. Is she just clingy because that's how she is? Or is it because she doesn't feel good? Does she bird feed because of the cancer? Or is that how she is? Is she teething? There is no book on "infant" cancers, its not like they can TELL you whats wrong. The great thing though is we are 1/2 way done with treatments (as long as the CT shows the cancer is shrinking) so that means hopefully 8 more weeks left of her feeling crummy. Our next rounds of chemo are 3 day impatient rounds, and they are both in Februaryv (So mark you calenders friends because I'm going to need some visitors to chit chat and keep me occupied, I can only check facebook so many times!). So there is a little light, but can we please fast forward to March already? I packed away Mallory's 3 month clothes the other day, and I was so sad when I packed away her newborn clothes, but this time I wasn't sad. I was glad, that was just a small sign that we are making it, she is getting through it, growing, and thriving. how cute is this picture of Mallory! 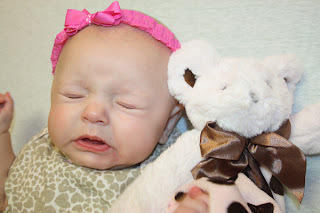 Only Mallory can look beautiful sneezing :) She is adorable!!! I'm glad you are seeing the end in sight. We are still praying you through.